Yesterday I went to meet up with some of my old friends. I wrote about them in my Chiang Mai trip(in case you want to check out my old entry XD). Our guide,Bou,has moved to study near Bangkok now so we can meet up with her more. 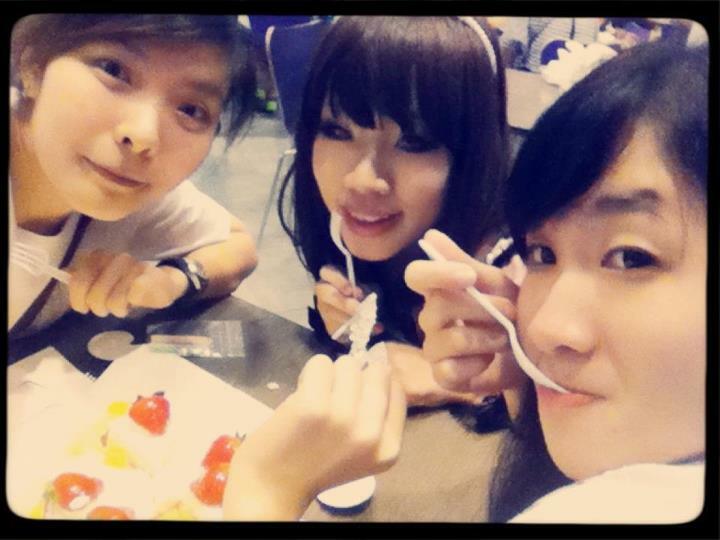 We met up at Digital Gatewat,Siam and went to have some meal. Next time gotta try something different!! This is what I ordered,Chicken Teriyaki set. Of course,we went to take Purikura,too. I think I makeup way too much comparing to them. Then we did 'something special' which was my request and I'll take about that later. Bou has to go home early after that so it's just me and Aum left. It rained so hard in the evening so we decided to have some ice-cream before going home. It's kid's menu tho but I wanted to try. Here comes the special part. This 21st August will be my bf's birthday,he'll be 28 this year. But since we're living so far from each other(USA and Thailand),we just can't celebrate it together. So,I decide to do something to celebrate it for him. I planned to buy a cake,take the pic and send it to him. This is the birthday cake we bought.